“The Cemetery Keeper’s Wife” by Maryann McFadden will bring out every emotion from readers as they follow Rachel Miller who marries Adam, a seventh generation cemetery keeper, after knowing him for only twelve weeks. After a traumatic event at the age of eighteen Rachel is having a hard time healing which has impacted all her relationships with men. While exploring the grounds of the cemetery Rachel is enamored by the striking and beautiful headstone of Tillie Smith, a kitchen maid who died over 130 years ago. Something about Tillie Smith draws Rachel to investigate more about her death; in fact, she becomes obsessed. As Rachel continues to investigate she finds that although their circumstances were different, each was abused, and used by men. Each woman tries to make their lives better in any small way they can. McFadden does an excellent job of seamlessly going between Tillie’s story, and the turmoil Rachel is experiencing. She presents the right number of characters so as not to overwhelm readers. This is the author’s fourth book, and she expertly provides just enough mystery and tension, yet at the same time her presentation of what each character experiences is heartbreaking. I loved how she talks about cover-ups and charging anyone with the crime so as to not tarnish the town’s name or its leadership. Just as we see today, those who are not guilty spend years in prison. While following Tillie's story, readers find someone who only wants to make her life better regardless of poverty, disregard for education, jealousy and shame. From the very first I was captured by the passion and direct narrative of the author. She doesn't want sympathy for her characters, but wants to show determination and self-growth. McFadden’s writing draws the reader directly into the plot and I wanted to scream at Tillie so she wouldn’t trust others. 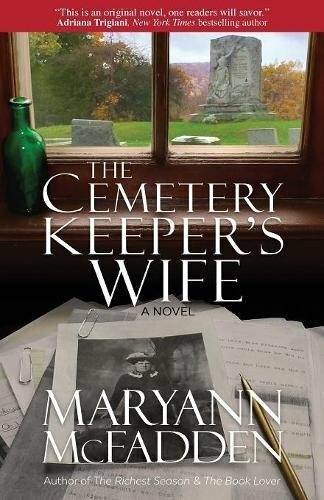 I highly recommend “The Cemetery Keeper’s Wife” by Maryann McFadden to anyone who enjoys historical fiction and mystery. I will be recommending it to my book club and will definitely read more of her books.